Illustration 150 in a row! Wooo hoo! Well, today was a day of re-charging and cleaning up the house (most of it) and a wee bit of socializing. The job that was on pause has started up again so I have stuff to do tomorrow. Yay! I will most likely spend Thursday back in the studio, getting stuff ready for painting and fixing up the place a bit more. Takes a while to set up a place when there is a lot of people involved. I figured I might as well start stuff while everyone else is setting up. 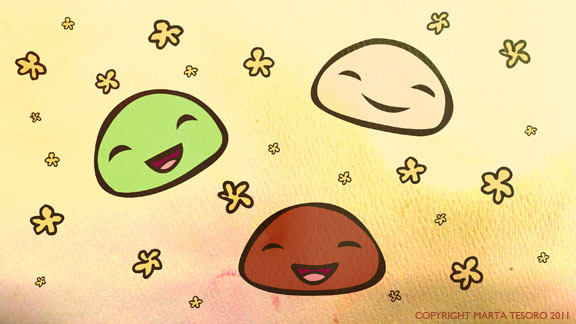 I have daifuku mochi on the brain. I do love my Japanese sweets! WOOOHOOOO, 150!!!! Mmmm, I love me some mochi. Love your hot air rabbit below, too! Very cool!